Oh, they are sooooo cute! 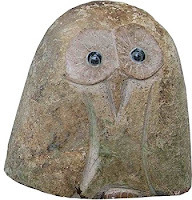 I love owls and I haven't seen the Stone Age Creations garden decor products before. They are absolutely adorable! They were so cute! I had never seen Stone Age Creations prior to this either. My wish list is soooo long now! Oooo! 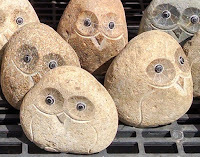 I just love these stone owls! I have a special connection to stones and would love to place a few in my garden but also I might need one or two in the house. Very unique! I was thinking the same thing about having one in the house after I get moved. I love how it looks like they are looking at me. How clever. And so adorable. Every garden needs a stone age owl ornament. I totally agree that every garden needs one. Oh my goodness, garden owls just don't get any cuter than this! Totally adorable! I like the company name (Stone Age Creations) and their story, too. I'm so glad you shared these, Dawn Rae! I couldn't wait to share both the link to the Stone Age site and the adorable owls. I like stories and items like this so very much. I'm just glad I'm not the only one that gets excited about things like this. Love, love, love these ornamental owls for the garden. I imagine they would make great paperweights too. Aren't they just the cutest things? They would make GREAT paperweights...or desk decorations. These certainly look like a perfect fit for any garden. What amazes me is when I see something like this I can't help but think of the craftsmanship it takes to make them. Thanks for sharing Dawn. Stone garden art just belongs in a garden. I love these little owls. The big ones, too.